Though his BA is in political science from Dickinson College, George actively studied dance, music and theater throughout his undergraduate years. He then went on to earn an MFA in dance and choreography from Temple University where he served on the faculty upon graduation. Notable teachers include Ann Vachon, Marcia Dale Weary, and Betty Jones; company credits include Ann Vachon/Dance Conduit, Coriolis Dance Company, Gathering Wild Dance Company, and Paula Kellinger and Dancers. As a teacher, he served as a Guest Artist-in-Residence at Temple University, Wilson College and the University of Nevada. He was also a resident choreographer and teacher at the Las Vegas Civic Ballet for four years. In addition, Staib serves on the Executive Committee for ACDFA as Vice President of Membership and served as an adjudicator for the South Regional Conference in 2013. George is on faculty at Emory University teaching modern and ballet techniques, choreography, and "Contemplate, Create, Debate", a freshman seminar he created to introduce students to the practice of seeing and making art. udith is an independent artist with a rich performing history as a choreographer, performer, and improviser. The Berlin-based director (Havana, Cuba) has worked with Sasha Waltz & Guest, (2011-2014); Deborah Hay, (2012); Trisha Brown Dance Company, (2006-2009); DD Dorvillier, (2002); David Zambrano, (1997), Mal Pelo Company, (1997-1999); and DanzAbierta Company, (1991-1996). In 2010 she established the JSR Company in New York City, focuses on multidisciplinary and site-specific performances. Since 2012 she has been doing a choreographic collaboration with Edivaldo Ernesto. "There is a name for it" (2013) and "NOISE" (2016) touring extensibly Europe, Latin America and Asia. Since arriving in Europe, JSR Company premiered in Berlin: "Micro Revolution", (2015); ”Sebastian Schunke Meets Judith Sánchez Ruíz”; The improvisational project "Mirror Equation” and "Encaje", her most recent work - on hypocrisy, drawing from the diaries of writer Anaïs Nin, plays with two concepts she has been exploring in her research for a while: « Diary exercise » and « Radio exercise ». Premiering at 13th Guangdong Dance Festival, Guangzhou, China, (2017), and touring the US, presenting the solo + A spontaneous duet honoring the memory of Trisha Brown featuring Jodick Melnick and Lance Gries, & music by Hahn Rowe. Recently Judith was the guest artist at Texas Dance Improvisational Festival (TDIF) 2018. Sánchez’s work has been presented in numerous International Festivals and has received commissioned choreography works at Danspace Project St. Marks Church NY; Work & Progress at Guggenheim Museum, NY, Whitney Museum NY, Storm King Art Center, NY. She has been awarded grants by The Rockefeller Brothers Fund, The American Music Center’s Live Music for Dance program as well as the Baryshnikov Arts Center: Martha Duffy Resident Artist Spring. Since in Europe her work has been presented at Bouge B, DeSingel Festival, Antwerp, Belgium; Tanzfestival im Kulturzentrum Tempel, Karlsruhe, Germany; OFFestival, Garage 29, Brussels; Belgium; Gdansk Dance Festival, Gdansk, Poland; Festival Deltebre Dansa, Spain, Tanz_house Festival, Saal – ARGEkultur, Salzburg, Festival El Cruce. Rosario, Argentina, El Porton de Sanchez, Buenos Aires, Argentina, Notafe, Viljandi, Estonia, 13th & 14th Guangdong Dance Festival, Guangzhou, China. Box L.A. / we live in space, Los Angeles, US, Brooklyn Studios for Dance, NYC, Performing Art Festival Berlin, Radialsystem V, Hong Kong International Choreography Festival, Hong Kong, East Point West | Interdisciplinary Festival of Embodiment, Kuala Lumpur, Malaysia. In the seven years after moving from New York City to Berlin, JSR stablished as a choreographer and teacher at major institutions of higher education in dance throughout Europe. Creating works and teaching at the NDH - The Norwegian College of Dance, Oslo, Norway (2014, 2018, SEAD Salzburg Experimental Academic, Salzburg (2016), Conservatoire National Supérieur de Musique et de Danse de Paris, France (2015, 2016, 2017), SNDO - School for New Dance Development, Amsterdam. (2017), the Danish National School of Theatre and Contemporary Dance, Copenhagen. (2010, 2014), at the Modern Dance Theater School, MTD, Amsterdam, Netherlands (2015, 2018, 2019), University of Music and Dance Cologne, Germany (2014, 2015, 2016); Companies like: Sasha Waltz & Dancers, Cie. toula limnaios, Amir Samir Company and summer workshops like Dance Umbrella Festival, London, Coda Oslo International Dance Festival, Oslo, Tsekh Summer School, Moscow, Objectif Danse, Marseille, Summer Melt: Movement Research, New York, 2st Tanztreffen der Jugend, Berliner Festspiele, Berlin, Germany, NYU Summer workshops, Berlin, Summer Workshop, Guangzhou, China and Deltebre Dansa Festival, Spain. Plus Ménagerie de Verre; Tanzfabrik, Marameo, Micadanses, Critical Path, Tanzquartier. Jennifer received her M.F.A. from Ohio State University and her B.F.A. from the University of Utah. She spent seven years in NYC touring and dancing with various choreographers including David Dorfman and Chris Burnside, and was also the Artistic Director of her own company. She teaches modern dance technique, composition, dance history, teaching methods, and The Creative Process. Salk is currently an Associate Professor and Dance Program Director at University of Washington. Born in Italy, Elita Cannata (1985) is currently based in Amsterdam. She has studied Countertechnique since 2005 and performed for anoukvandijk dc in 2007 and 2008. She attended her first Countertechnique Teacher Training (CTTT) program in 2014 and, with the support of the Amsterdams Fonds voor de Kunst, returned to the CTTT in 2018 and progressed to the level Senior Teacher. 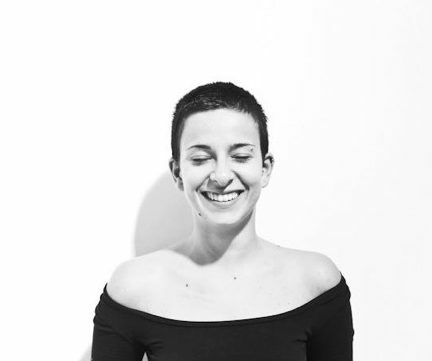 Elita Cannata graduated with a Bachelor of Dance in 2007 at Rotterdam Dance Academy / Codarts in the Netherlands and in 2011 got her MA in Theories of Performing Arts at the Università degli Studi in Bologna. During and after her graduation she performed for José Navas, Megumi Nakamura, anoukvandijk dc, Cathy Sharp Ensemble, Compagnia Tpo & Tom Dale, Tan Temel, Samuele Cardini, Emanuel Gat (Biennale College), Itzik Galili, Lynsey Peisinger, David Middendorp and Fabrizio Favale among others. Next to her dance and teaching career, she also works for several dance companies in the Netherlands as a Rehearsal Director. WHAT IS COUNTERTECHNIQUE®? Developed by Anouk van Dijk, Countertechnique® is a movement system to help the dancer think about the dancing body, focusing on the process of incorporating information into action. Countertechnique® allows the moving dancer to work with an ever changing dynamic balance. The consistent use of the counter direction in all movements is key to the technique; both the awareness and application of this principle is trained throughout the Countertechnique® class.